A work colleague once asked me if I order in restaurants the same way that I order coffee. I thought his comment was pretty funny, especially since the weekend before my husband had said I was a waiter’s worst nightmare. “What do you mean?” I asked my husband. “Well, you like to change everything in the dish. You want to order the steamed fish but have them fry it instead, and have the sauce on the side instead of pouring it over the fish – and if it comes with potatoes, you want rice instead!” He said. But I did have to concede to my work colleague that being finicky with my coffee never earned me any brownie points with the baristas. One day I’m having a cappuccino with one sugar then the next I’m having it with one and a half sugars. Then I learned that you get more milk with a latte so I switched to that (with one sugar). Then I went off coffee and started having chai lattes – then soy chai lattes, then I missed my coffees and got back on to the lattes – but I wanted a weak latte, one and a half sugars and chocolate sprinkles on top…. oh and extra creamy. And then I switched to tea – but that’s a whole different story altogether! The one thing that remains constant though, is my love for a great biscotti. Regardless of what drink I’m having, a perfectly made biscotti always goes well. 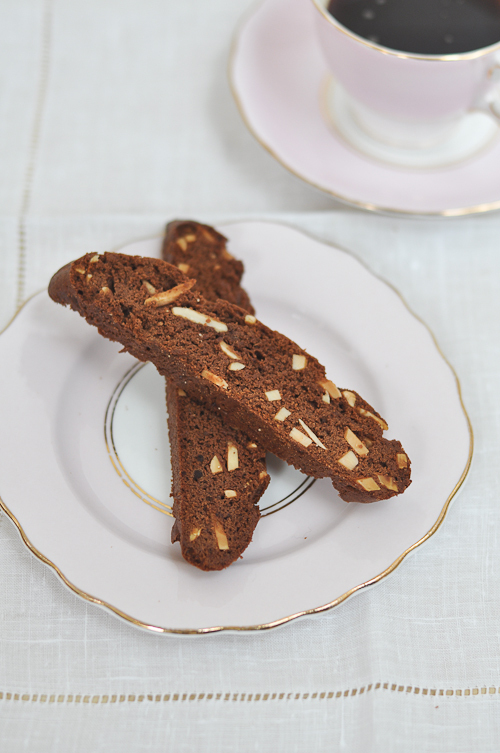 I simply love biscotti as it makes the perfect snack with tea (or coffee), especially since you can store it and bring it out when you have unexpected visitors. This recipe keeps for up to a week in an airtight container. 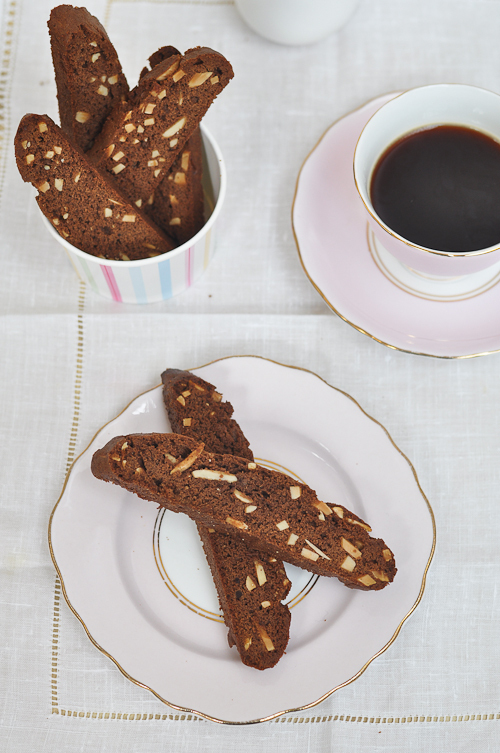 I’m especially partial to this Chocolate and Almond Biscotti recipe. When making this remember the dough is quite soft – so I used some cling wrap to shape the dough and then chilled it in the refrigerator which made handling much easier. You’ll also want to make sure to have a sharp serrated knife so that when you cut the biscotti. Remember, aim to cut the biscotti in one go – avoid a back and forth motion so you don’t shatter the loaf. In a bowl mix together the flour, cocoa powder and baking powder. Set aside. Add the butter and chocolate to the egg mixture and then add the flour mixture. Fold the mixture until smooth. Add the almond slivers evenly throughout the batter. The dough should be quite soft. Line a baking sheet with some cling wrap and place the dough onto the cling wrap and shape into a loaf, around 6 cm wide. Use the cling wrap to shape the loaf. Smooth and even the sides and cover with the cling wrap. Place the baking sheet with the biscotti load in the refrigerator and allow to chill for around 2 hours. Bake the biscotti for around 30 minutes until the loaf has spread and risen. The loaf should feel firm when pressed. Cool the load on the pan on a wire rack. When cooled, use a sharp serrated knife to slice the baked loaf, around 1 cm thick. Return the slices to the baking sheet and bake for 10 minutes. Then turn the slices over and bake for another 8 minutes. Cool the biscotti completely. hello Trissa, I just made this recipe and came out perfect! since I am gluten allergic I made it with rice flour. the first thing i did was to double your recipe …. just in case 🙂 they are now cooling and can’t wait to have them with my morning coffee tomorrow. i have about 18-20 pieces using 280gr of (rice)flour. thanks for sharing! I’m exactly the opposite about coffee – but don’t get me started on tea (true to my English roots!). Lovely pictures and recipe. Nothing wrong with requesting something the way you prefer it, Trissa! I do….although I suppose the kitchen gets annoyed with us. You can’t go wrong with these biscotti though. Delicious! Love it! Amazing, keep up the good recipe work. Biscotii are something I’ve never had success making. They always crumble. I’m so scared to cut them that I end up sawing through them and they crumble. YOur beautiful ones make me think I need to try them again. Yum, that biscotti looks so good. I used to grab a daily pack from Hudson’s even though their coffee was crap. I think I switched to tea around that time, too. 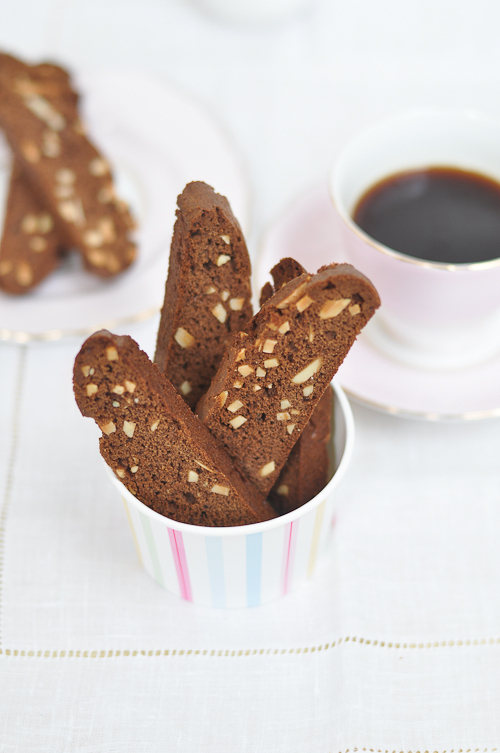 Biscotti are great for dunking in tea! Your biscotti looks fantastic!! I love your tea cup and saucer too, so cute. I agree with the tip of having a serated knife for cutting the biscotti. There is nothing worse than shattering it with a blunt knife. Hi Trissa! We probably unwittingly crossed paths before. We always dreaded ‘finicky’ guests. And we always remember them years and years later. Hehehe! Oh… I love Biscotti too! I am the same with coffee/tea/chai! Always changing my mind. And I agree with you – a well made biscotti is very necessary! Have you tried making cantuccini? It’s slightly smaller and thicker than a biscotti. I’ve made one with almonds, flavoured with orange zest and cointreau – which I’ve given as a gift. LOL my mom is like that and my boyfriend gets some social anxiety, including in restaurants, so he’s always mortified when we go out together! But the last time we all went out the waitress was spunky and actually kinda called my mom out on being demanding (in a nice way though) so he got to laugh at that. As for biscotti, I am the same way dear! Whether it’s coffee or tea, I always have to have my biscotti. Thanks for the slicing tips as I have trouble with them breaking and I’ve never even attempted ones as thin and beautiful as yours =D. On the plus side, the biscotti looks wonderful. Hopefully things are good at your end. Still busy? It’s not bad to want things the way you do though. I’ve never made biscotti before, ever, but I just love them with my morning coffee. They look great Trissa. They look delicious! How many biscotti did you get with these quantities?